Often it is the local and regional governments which actually work for their citizens’ best interests. They are closer to us and therefore somewhat responsive to us because we actually can talk with them - our mayors, council people, city / township managers and county officials. Importantly, many cities and regions throughout the world work together to solve common problems. And, they have been doing so for years - without the interference of their national government legislators. Let’s work together to get things done locally and regionally. Now is the time for your community to join in. 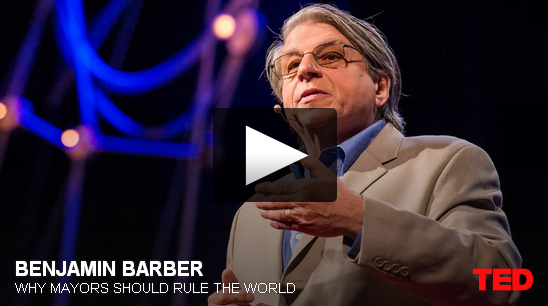 Please watch Dr. Benjamin Barber's TED talk, “Why Mayors Should Rule the World” below (click on the image) or read a PDF of his presentation here. Please also read Dr. Richard Florida's The Atlantic Cities interview of Dr. Barber here: What If Mayors Ruled the World? CityLab: Urban Solutions to Global Challenges was held 6-8 October 2013, New York City. Go here for several links to information which was presented and here. Please consider watching the two videos below:The Aspen Institute, Engines of Prosperity: Urban Success Stories of Economic Development and the Morning Joe interview of NYC Mayor Mike Bloomberg; Eric Garcetti, Mayor of Los Angeles and Lisa Scaffidi, Lord Mayor of Perth Australia. Each of us must take an active role or help create a grassroots organization and make our government, our nation, work for all of us. Tell your story; create your strategy; create your organizational structure... We are All Partners in This Life. First, We Agree to Help Each Other. How? Please watch this Moyers & Company video segment: Making Social Movements Matter.